Enroll today and receive your level 1 photos totally FREE!!! who have not had lessons before. Start your child's lessons today. Classes starting soon in your local area. 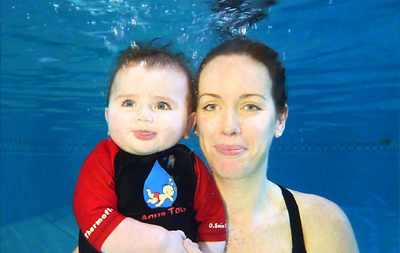 Our amazing Aqua Natal classes are great for expectant mums. Come along and enjoy some relaxing time in a warm and quiet pool. Do you know of a pool for hire? Let us know and swim for FREE!!! Have you ever wondered just what goes on in an Aquatots class? Well let us show you. Give your little one a gift for life! Not only has the Aquatots programme been carefully enhanced and adapted over the 18 years to be the best Baby, Toddler and Child swimming program available, but we also take care to ensure that the babies and children are swimming in a suitable and warm environment. For example our baby classes will also be taught in warm, shallow private pools ensuring the perfect relaxed surroundings for new parents and first time swimmers. Once the children are able to swim independently, we move to bigger pools providing the extra space required, so all swimmers are encouraged to develop their skills to their maximum potentials. We also want and need our parents to join into the water throughout the programme, even into the later swim levels. This not only keeps this activity as a shared family event ensuring learning continues outside of our lessons, on holiday for example, but also avoids that common issue in many other swim clubs without parents where children sadly spend lots of wasted time waiting for a Teacher to swim with each one individually and in that time start to get bored and lose their enthusiasm. Having a parent in the water ensure that each child have a personal assistant at all time, to enhance and speed up the learning process all together. 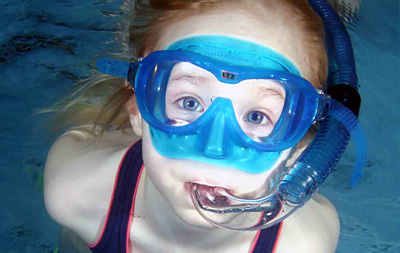 Aquatots was founded by mum to two Evy Bentzon-Jones in 1997. Evy started off initially with just 20 swimmers a week in two pools. Within a year Evy had increased this to 5 pools and 104 babies swimming with us. From here the first 3 levels were introduced and Aquatots began to grow through Evy's passion, enthusiasm and teaching ability. By the turn of the millennium Aquatots has run their first teach training course, now with 6 teachers to meet the needs of the 500+ swimmers we were teaching each week. Aquatots also moved into the office on the Brighton Road in 2000 where we are still based today, some 15 years later. Aquatots first breached the 1,000 swimmers a week milestone in 2001, as we also increased to 13 teachers and 8 swim levels. As the years rolled on, Aquatots never stood still and continued to develop new levels and skills to meet the growing demands of our young swimmers, recruiting more teachers all the time, and increasing the support staff from the office. In 2008 we finally broke the 2,000 swimmers a term goal we'd set ourselves, something which we could perhaps never of dreamed of back at the very start just 11 years before. 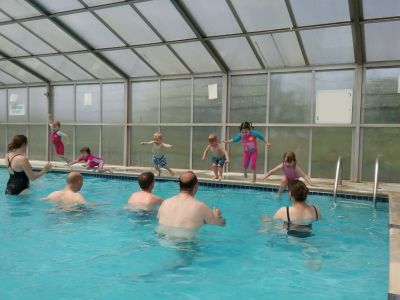 Our 25 pools were proving popular as ever in our now expanded 21 swim levels. Fast forward slightly to 2012 and we then reached out next milestone of an unbelievable total of 2,500 swimmers a week. We were now swimming at upwards of 30 pools and ran our 23 swim levels 7 days a week. Our teaching team had increased as well to over 35 teachers as well. 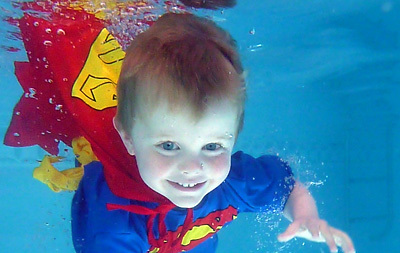 Today Aquatots are still at the forefront of the baby swimming industry, leading the way, having fun and teaching over 3,500 children a week how to swim and enjoy the water safely. The passion Evy started with in 1997 is still there shining through, and it's with immense pride Evy sees this in all the Aquatots Team each and every day. Aquatots aim has always been to provide swimmers with the best, most progressive, structured and fun learning environment available, something we feel we achieve every single day! The environment in which your baby learns is crucial when ensuring his/her first experience of water is a positive one. The relaxed and friendly atmosphere we aim to provide, coupled with the use of warm (in most cases, hydrotherapy), clean pools, should make the whole experience a pleasurable one for you both. New skills are gently introduced and your baby will very quickly get used to short swims and submersions, taught using methods that are fun, using word association and repetition. Regular play breaks enhance the learning process. Amazingly, most babies will astound you with what they achieve in the first term, all with a little help from you, of course! 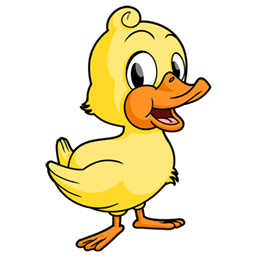 Note, To all of our lovey new fluffy Level 1 Duckling Swimmers: We have lots of New Duckling Classes starting each term, at many of our pool locations. We ask that all of our New Swimmers, booking with Aquatots for the first time, to please contact our office booking team, using the following phone number: 020 8688 6488, either before, or after you make the payment for your lessons. The office team, will be able to discuss with you the options available and help you to select the right pool location, lesson day and time to suit your needs. You may continue to pay for your course now, doing so, will help to speed up the booking process and the securing of your swim slot, as when you talk with the office team, they will be able to find your payment and allocate your lesson immediately, having already received your payment for the course. We look forward to talking with you very soon. So, please call us as soon as possible, to discuss the time slots available, and your personal preferences. Our Ducklings courses fill up fast, but there are hundreds of spaces to choose from, the earlier you call, the more selection will be available to you. Clicking the ‘Buy Now’ button, will take you through a simple booking process. May we ask that you use your childs’ name as opposed to your own. This helps avoid any confusion when searching for your child’s swim booking. 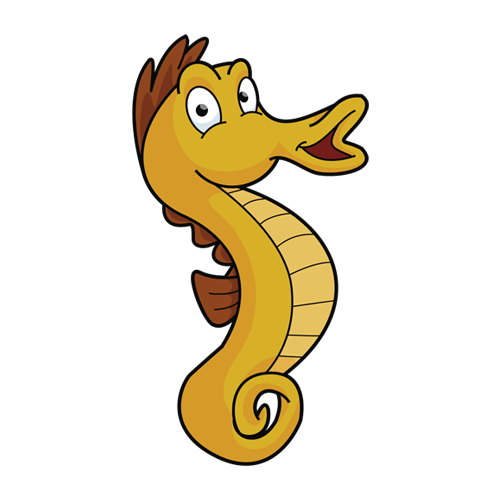 The good news is, the next time you enrol, into following swim terms, your child will have their very own log in name and password (these will be sent to you), so you will not need to enter their details over again. Please don’t delay, let’s start swimming today. We look forward to talking with you very soon. 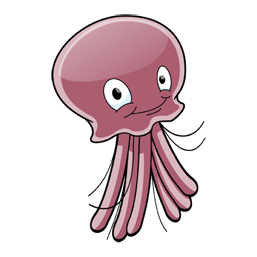 Hi, I'm Jonty the Jelly Fish and thanks for popping by to say hi! We have four Foundation level programmes designed for children from the ages of 18 months up to 6 years who’ve not been in swimming lessons before. Foundation 1 Jelly Fish - for non-swimmers between 18 and 30 months - Designed for those who are just too old to enrol onto our Ducklings Level 1 class, these sessions get your baby and you used to our structured learning environment and submersion method of swimming, ready for integration into one of our regular 29 swim levels. Upon the successful completion of your foundation level your swim teacher will advise you which entry level is best for you to join the following term. 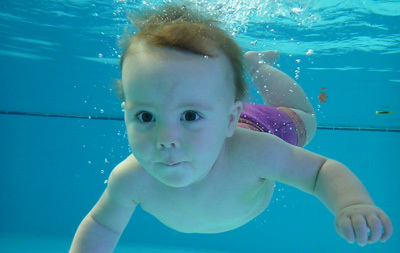 Aquatots teaches babies to swim the natural way, underwater and without employing the use of artificial buoyancy aids. The Aquatots programme is unique in its design and sets the standard across the baby swimming industry. Hi, I'm Shannon the Shrimp. 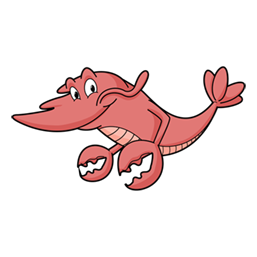 Foundation 2 Shrimps - for non-swimmers between 30 and 48 months - Designed for those who have not yet been in regular structured swimming lessons before, ready for integration into one of our regular 29 swim levels.